Experience church growth through evaluation. 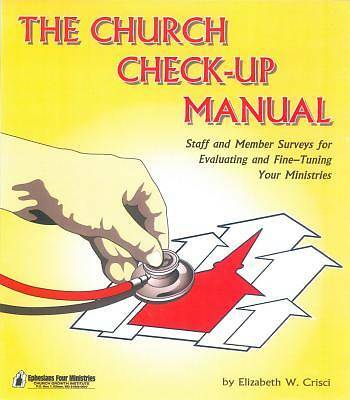 The Church Check-Up Manual provides a wealth of staff and member surveys for evaluating and fine-tuning your ministries. Evaluation will help keep your ministry fresh rather than allowing it to become stagnant. It is a means checking programs, workers, future and current plans to see how they are working or will work for God's glory. The goal of this manual is to promote a healthy church through self-examination, surveying people's thoughts, and assessing the anonymous responses. Done correctly, this will result in the church better understanding themselves, a deeper appreciation of what is being done for them through the leadership, and a closer walk with God. 10 Chapters of Surveys: Evaluation on a Personal Level, Staff Evaluation, Church Members Evaluation, Christian Education Workers Evaluation, Youth Workers Evaluation, Young People Evaluation, Outreach Workers Evaluation, Worship Leaders Evaluation, Choir Members Evaluation, Evaluation of the Evaluation System. Includes: 167-page reproducible manual and CD of surveys for personalization.